Logan Magee, a student at The New School, has received an Honorable Mention Commendation from the Frederic Whitaker and Eileen Monaghan Whitaker Fine Art Scholarship program for her watercolors, Celestial Body 1 and Celestial Body 2. Logan, whose hometown is New Orleans, Louisiana won a $2,000 Whitaker Foundation scholarship in 2017. This past school year was my first year in college, at The New School, to study at Parsons School of Design and Eugene Lang College of Liberal Arts. Upon moving to a new city, a new school, with new people, I promised myself to stay true to myself during a time of immense change. While being handed stacks of projects every week, in each assignment I made an effort to find some truth about my own art, or rather, to learn a new way to design my truth. Second semester, after dealing with issues sourcing from homelife, I began exploring my emotions and my body in a way that I felt I could universalize for others to relate to. I am a highly empathic being. When I think of the emotional content I discuss in my work, I’m inadvertently made to understand that others experience some of the same feelings. When I think of visual motifs I use, I know that others will see a piece of themselves reflected in it in some way. Therefore, anytime I search for an answer to something in myself, I also feel that I gain an understanding of how other people work. What I explore in my art is questions of being. Recently, I have produced multiple pieces on the concept of space, and whose bodies are allowed to take up space. This idea spurned from my own experiences in going to art college, in which I was often the only person of color or black student in my classes. I felt that my presence in the class was exemplary of the little space given to black people both in higher education and in the art world. I felt small. Throughout the year, I thought about how systematically, some bodies are not given the same amount of space, either socially or physically, as other bodies. In the pieces submitted for the Whitaker and Monaghan scholarship, I explored this concept of space in regard to feminine bodies. I explored this idea through the lens of fashion, and how fashion advertisements tend to make women look smaller. Not only that, but the women shown are usually white, cisgendered, and skinny. 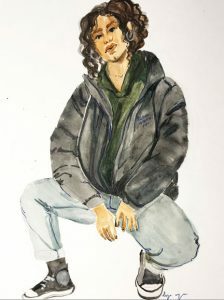 To subvert this gender hegemony, I produced two watercolor images of femme-identifying people of color, in poses that are open and wide compared to the restraining poses women are usually displayed in. I also had both models wear puffer jackets, which are articles of clothing that are non-gender specific and consume a large amount of space. I felt that the puffer jacket was the perfect clothing item to serve as the antithesis for the limited space given to mainstream models. In the future, I would like to continue to explore space as a social construct. I would also like to create more works about emotion and physical state, within myself and larger populations. Being in New York has allowed me to delve into these concepts in an expansive environment, and I believe being in the city has benefitted me overall. Receiving the Whitaker and Monaghan scholarship would be extremely helpful to my staying in the city, as I am no longer receiving financial help from my father, and would not like to burden my mother with extra costs. I was fortunate enough to receive the award last year, and it greatly supported my school project expenditure, as well as books and supplies. For that, I am deeply grateful, and give many thanks to the Foundation for being a big part of my first year in college.